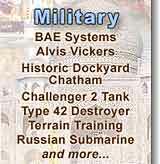 both aged 28, will take place on 29th April 2011 at 11:00. 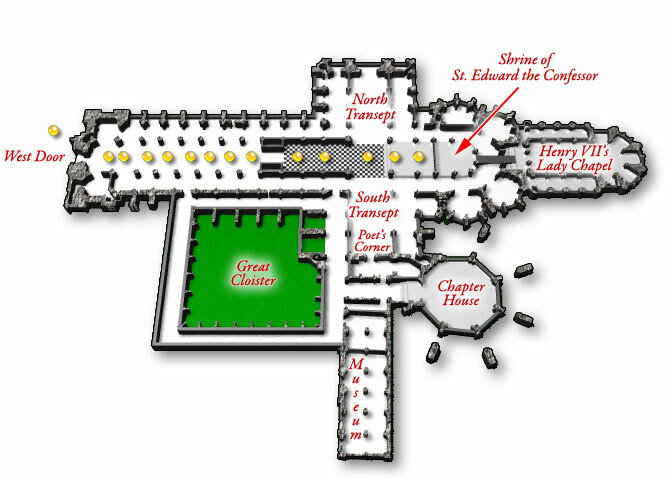 The Westminster Abbey processional route is shown below, starting from the West Door and progressing eastwards up the Nave, through the Quire and up to the High Altar. 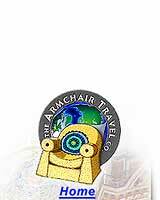 To see panoramic views of each important point, please click on the gold buttons. Westminster Abbey has always enjoyed close links with the monarchy, not least in its unbroken role as the coronation church since 1066. King Edward (later Edward the Confessor) established his palace here and built for it a large stone church which then became his own burial place. In the mid-thirteenth century Henry III rebuilt the Confessor’s church, providing the spectacular Gothic building we have today. Henry’s own burial here in 1272 established Westminster as the principal royal burial place for the next 500 years. Richard II, Henry V, Henry VII and Elizabeth I were all influential in shaping the Abbey’s history. The last phase of building was the completion in 1745 of the West Towers in Portland stone, to a design by Nicholas Hawksmoor, the Abbey's Surveyor. St. Margaret’s Church, alongside the Abbey, is the parish church of the House of Commons. The bride will arrive by car and leave in a gilded carriage, as befits a new princess. 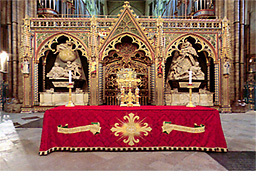 Westminster Abbey is a ‘Royal Peculiar’. This means it is a free chapel of the Sovereign, exempt from any ecclesiastical jurisdiction other than that of the Sovereign. 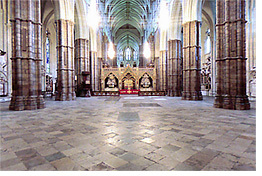 Fifteen royal weddings have taken place at Westminster Abbey, starting with Henry I to Matilda of Scotland in 1100 AD. As well as the marriage of the Queen and Prince Philip in 1947, her sister Princess Margaret in 1960, and two of her children, Princess Anne in 1973 and Prince Andrew in 1986 were all married here. 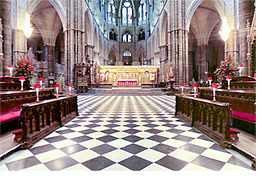 Prince Charles was married to Princess Diana, Prince William’s mother, in St. Paul’s Cathedral and latterly to Camilla, Duchess of Cornwall, at St. George’s Chapel, Windsor - another Royal Peculiar church. 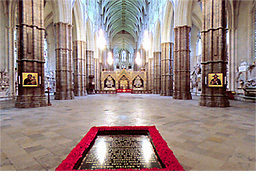 A few feet inside the main entrance to Westminster Abbey, at the far western end of the nave, is a black marble tombstone permanently surrounded by a border of greenery and poppies. In a place where monarchs and statesmen, scientific pioneers and composers are buried, it is the only gravestone in the Abbey that may not be walked upon, and contains the remains of an unidentified soldier of the first world war. 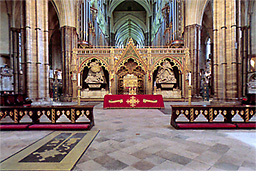 When Henry III died in 1272 only one bay of the nave beyond the choir screen had been completed. The old Norman nave remained attached to the far higher Gothic building for over a century until more money became available at the end of the fourteenth century. The western section of the nave was then carried on by Abbot Litlyngton and work slowly progressed for nearly a hundred and fifty years. It was probably Litlyngton who insisted that the general design of Henry III's masons should be followed, thus giving the Abbey great architectural unity. 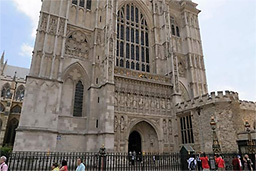 After entering the West Door on 29th April 2011, Kate Middleton will progress up the Nave to the Quire on the arm of her father, Michael Middleton and accompanied by her bridesmaids, who are likely to include her 26-year old sister Pippa. Lady Kitty Spencer, 18, who is Prince William’s cousin and Viscount Linley’s 8-year old daughter, Margarita Armstrong-Jones are also in line to be selected, as well as some younger pages and bridesmaids. In a Royal Wedding, typically 6 to 10 pages and bridesmaids follow the bride. It is on the cards that Kate will be given a royal title after her wedding, though apparently Prince William wishes to remain just that, in which case she will become “Princess William”. It might set an unfortunate precedent if she was to be called Princess Catherine, with an number of minor royals (Princess Michael of Kent, known as ‘Princess Pushy’) demanding the same right. 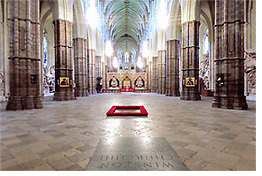 No doubt Prince William will spare a thought, as he walks up the Nave of the Abbey, for the sad occasion of the memorial service to his mother Diana, Princess of Wales in 1997. 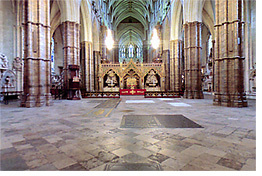 Westminster Abbey has been described as 'the parish church of the world'. As well as historic links with Europe and America it maintains strong contemporary relationships with all Commonwealth countries. It is expected that many official guests from all over the world will attend the Royal Wedding. 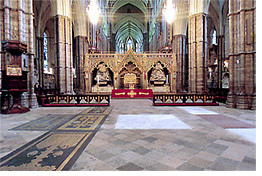 Many of them are likely to be seated on either side of the processional route in the Nave. Much of the organisation of the Abbey’s facilities for the event will be carried out by Sir Stephen Lamport, the Receiver General. 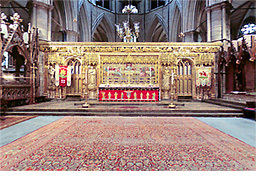 The Altar shown here with its red cloth, is used for everyday services and will be removed for the Royal Wedding in order to allow the procession to go straight from the West Door to the Quire. The organ pipes can be seen above and beyond the Quire screen. 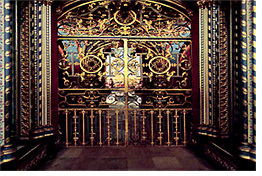 The gold painted gates barring entrance to the Quire will of course be open for the Royal Wedding to allow the procession and guests to pass through from the Nave into the Quire. On the left side of the gates is the memorial to Isaac Newton. Above the Quire screen the powerful organ built by Harrison and Harrison for the Coronation of King George VI in 1937 has five manual keyboards and over 100 stops and is designed to provide a great presence to support large congregations on state occasions with fanfare reeds and a robust chorus. The two organ cases were coloured and re-instated in 1959. The choir of Westminster Abbey, comprising some 30 boys, is one of the best known in the world and regularly undertakes tours in the USA, Far East, Russia and Europe. Its recording sessions have yielded acclaimed records of the choral works by Sir Edward Elgar and Christmas Carols, amongst many other works. The choir and the Abbey music is directed by James O’Donnell, Organist and Master of the Choristers. 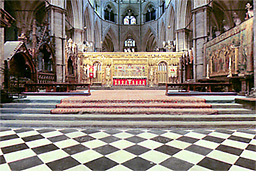 A spacious area between the high altar and the beginning of the quire was necessary to provide a ‘theatre’ where coronations could take place. 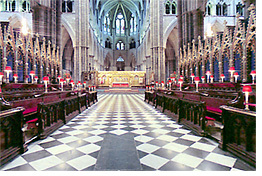 In the South Transept, in front of the Quire, will be arranged seating for the Queen, Prince Philip and the rest of the Royal Family, together with friends of Prince William. In the North Transept will be seating for the Middleton family, their relations and their friends, alongside Kate’s own friends. In Poets’ Corner in the South Transept numerous poets are buried, including John Dryden, Tennyson, Robert Browning, John Masefield, Dr. Samuel Johnson, Charles Dickens, Richard Brinsley Sheridan, Rudyard Kipling and Thomas Hardy. Many other poets are memorialised here, including, most recently, Sir John Betjeman. The marriage service itself will take place on the great pavement in front of the High Altar. In the panorama here we see a carpet on the floor protecting the extraordinary inlaid stone decoration, known as Cosmati, after the Italian workmen who designed and laid it down in 1268. It will be visible at the wedding, the carpet having been removed. The pavement is almost 25 feet (7.5 metres) square and consists of geometrical patterns built up from pieces of stone of different colours and sizes cut into a variety of shapes: triangles, squares, circles, rectangles and many others. The central roundel is made of onyx and the pavement also includes purple porphyry, green serpentine and yellow limestone. It is unique. 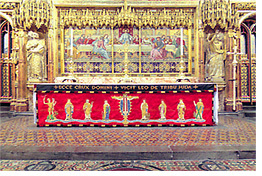 The Retable or altarpiece dates from the 13th century. This is England's oldest altarpiece - a panel shows the figure of St Peter, the patron saint of the Abbey. On the high altar (by Sir George Gilbert Scott, 1867) are a glass mosaic of the Last Supper by Salviati and fine sculptured figures. From here the Dean of Westminster, the Very Reverend Dr John Hall, will conduct the Royal Wedding service, although the Archbishop of Canterbury, Dr. Rowan Williams will actually marry the couple. The Bishop of London, the Right Rev. Richard Chartres, will give the address. The Dean of Westminster and the Bishop of London have long-standing ties to the Royal Family.